Home › Online Dating › Online Dating Advice for those frustrated and overwhelmed with getting online and getting dates. Online Dating Advice for those frustrated and overwhelmed with getting online and getting dates. For my teleclass this week “A New Way of Thinking about the Internet Dating as a Way to Find True Love” we had about sixty people on the call. I discussed the top online dating mistake that I find that most of my clients are guilty of: Not making enough time and space for a significant relationship in their life. Why is that a dating mistake? Because people perceive you as being too busy for them and that’s a huge turnoff. No one wants to feel like they are being squeezed into their schedule. My Online Dating Advice to my clients is to make the time for this endeavor. Schedule it into their calendar as they would any other of their commitments. Your suitor would like to see that you have the time to build a personal relationship! That is why my now husband did not ask me out for a second date when we first met five years prior! For those who were on the call, I am sorry that the audio sound quality was not a 100%. I have not had that experience before and I have been using this service for a while. Thank you for bearing with it and sticking it out. To find our about the Successful Internet Dating program go to www.successfulinternetdatingprogram.com is the website. If you have trouble accessing the site, then try to copy and paste the url into your browser. Note that there is a valuable bonus if you sign up by midnight 11/20/11 EST. You will be able to attend my two live Questions and Answers phone sessions in December and January. So don’t delay. I promise that my six week Successful Internet Dating program will make a positive difference in your online dating and your dating, overall. Also, the special VIP Flagship launch price of the program is available until 11/20/11. I look forward to working with you to meet that special someone- sooner than later. P.S. If you missed the teleclass and want to brave listening to the recording (My voice is cut off every few minutes), sign up at www.successfulinternetdatingteleclass.com and you will get an email with the link of the replay. 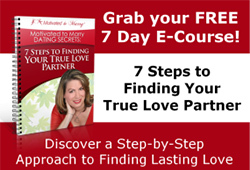 ‹ Online Dating Tips: How to Get Back Online Now and Find Someone who interests you! One problem I had with this the first time I saw it brought up here in the blog is that men do that all the time. They *assume* you don’t have time for them, but they don’t actually *ask* you. So they waste your time — which for a woman can be more critical — as well as their own, if they’re tired of looking for the right person, because they just can’t be bothered to communicate. So we got lives, because they can’t think we’re idle. But now that we have lives, we’re too busy for them?? And, I mean, never mind the whole thing where there really *are* things women want to accomplish with their lives … but the whole cultural narrative is about women shaping their lives around men, because men won’t compromise. In a corporate relocation, whose job is the family relocated for – still? The man’s. If two PhDs are trying to build a relationship, whose tenured position gets relocate for? The man’s. Ask the academic women in your circle the last time any men they were involved with moved for them because they (the women) were the ones with the job offers — and if the men *did* move for them, ask them how much flack the men and the couple received for *both sets of in-laws*. Once again, women can’t win.